US-China trade talks are in the spotlight again this morning as the President is set to meet with the Chinese Vice Premier shortly after the close this afternoon, and he just tweeted that talks are ‘moving along nicely’- a phrase we have been hearing for months now. Jobless Claims were just released and came in lower than expected at a 49-year low of 202K versus forecasts for 215K. We’ve said it numerous times before, but Jobless Claims continue to amaze! While not a new low, Continuing Claims also saw their largest weekly drop since November. Yesterday marked the 100-day mark since the 2018 closing low in US equity markets. During that stretch, the S&P 500 has rallied 22%, which for most people would be considered a great year let alone a great quarter. Among various industries, though, some of the gains have been even more extraordinary. 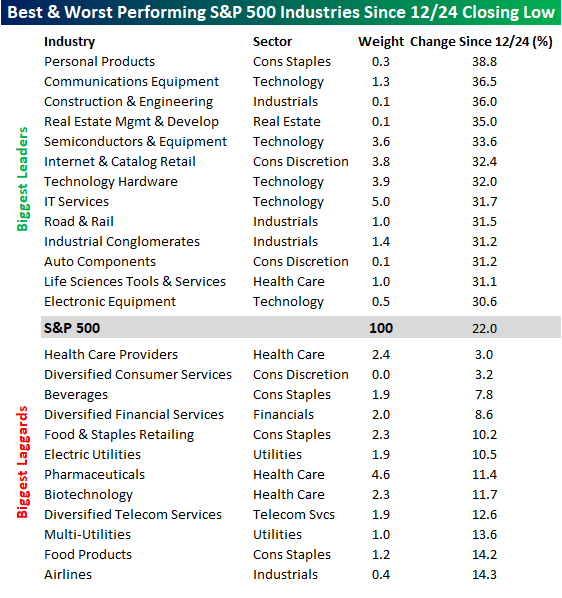 The table below lists the best and worst performing S&P 500 industries since the close on December 24th, along with each one’s overall weighting in the index. As far as winners are concerned, there have been some big ones as 13 have seen gains of over 30%. 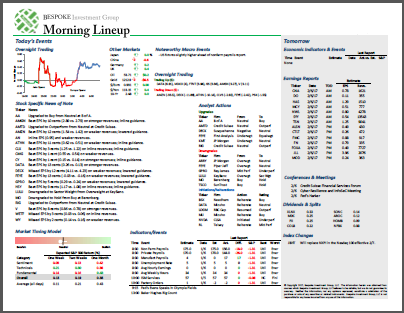 Personal Products, a member of the Consumer Staples sector has led the way higher with a gain of just under 39%! Consumer Staples is not normally the sector that comes to mind when you think of big rallies, but there it is right at the top of the list! Behind Personal Products, Communications Equipment (36.5%), Construction & Engineering (36%), and Real Estate Management & Development have all gained 35% or more. While an industry from the Consumer Staples sector has been the top performer, industries from the Technology and Industrials sectors are the most well-represented with five and four, respectively. On the downside, there hasn’t been any as every industry in the S&P 500 is up since the 12/24 lows! In terms of laggards, Health Care Providers and Diversified Consumer Services are the only two groups that are up less than 5%. Additionally, there are only two others that are up less than 10%. Hard to believe that being up over 10% in just over three month’s time can still be trailing the S&P 500 in a big way.